We invited Monique Warren, the owner of Hay Pillow, to guest blog about slow-feeding savvy. Studying equine nutrition and the equine hoof health are her passions. She writes from her home in southern California. 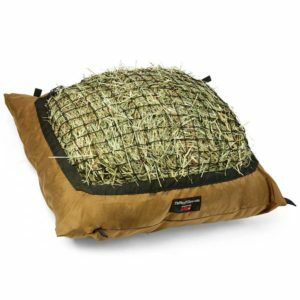 You can win a free standard-sized Hay Pillow by messaging us on Facebook. Check out our BestHorsePractices and NickerNews facebook pages for details! 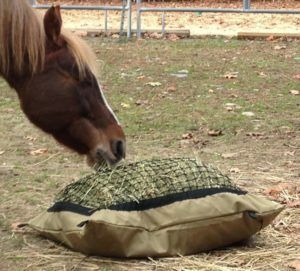 Here, Warren highlights the advantages of using a slow-feeder like Hay Pillow. Horses are not physiologically designed to eat meals. They benefit most from nearly constant grazing. Feeding meals has been shown to increase cortisol, the hormone associated with stress. If cortisol is elevated, insulin rises, which leads to fat storage. This can cause or worsen obesity, which is why some horses seem to be able to “live on air.” Even overweight horses should receive a minimum of 1.5% to 2% of their body weight per day in grass hay that is low in non-structural carbohydrates. If appropriate forage is available at all times, they can typically eat more and maintain or even lose weight. The equine stomach produces acid 24 hours a day in preparation for constant uptake and it can empty in as little as 15-20 minutes. Chewing activates saliva (an alkaline substance) production, which buffers gastric acid. 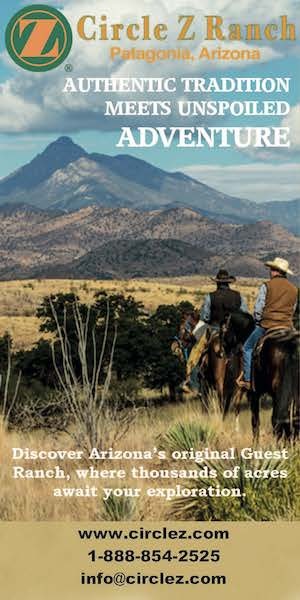 Under natural conditions with free-choice forage, the horse will produce about five gallons of saliva every day and eventually “recycle” much of the water content via re-absorption prior to excretion. Fiber present in the stomach prevents the “splashing” of acids. The lower part of the stomach, in addition to producing the acid, receives protection by also producing mucus. The upper, or non-glandular section has no protection and thus is more susceptible to damage by acids. Having fiber in the stomach is especially important during any physical activity. If your horse consumes hay too quickly, the chewed particle size will not be reduced sufficiently or have a high enough saliva-to-forage ratio. Large amounts of dry matter lacking sufficient saliva can contribute to impaction colic. Optimal digestion and fermentation require time and movement. Mobility stimulates gut motility. Providing forage free-choice in multiple locations will encourage both. This will promote consistent fermentation, effectively keeping the hindgut both weighted (to discourage twisting) and motile, thereby preventing conditions that can contribute to colic. The primary site for fiber digestion is in the hindgut. There, the healthy balance between beneficial and harmful bacteria can easily be disrupted by periods of time without hay or grass intake (fiber). Maintaining a consistent population of beneficial bacteria is essential to ensuring healthy gut function. Equines allowed to continuously slow feed benefit psychologically. Slow-feeding horses are less likely to develop vices. Horses sleep only 3 to 4 hours in a 24-hour period and usually no longer than 20 minutes at one time; food tends to be their main focus. Increased chew time wears teeth more naturally when eating at ground level. A natural grazing position allows the mandible (jaw bone) move up and down, side to side, forward and back without any restriction; facilitating optimum mastication and reduction of particle size. 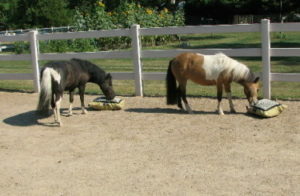 As prey animals, horses naturally prefer to eat outside in the open and they can be stressed when stalled. When eating from ground level in an unobstructed area, their peripheral vision is not impaired and they may feel more secure and safe. In these conditions, slow feeders are ideal. If your horse is overweight, slow feeding will help to regulate insulin spikes, metabolism, and secretion of cortisol. For underweight equines, it can help increase digestion and assimilation of calories and nutrients. Slow feeding with multiple locations enables your entire herd to eat and live together full-time. Equines are herd animals; they benefit physically and psychologically from direct physical interaction. Dominant members will keep the others moving as they claim various locations. The less dominant individuals will have alternate sources to eat from; this encourages movement and can decrease cortisol levels associated with stress from being physically separated from herd members. Equine meals may be stressful to you, too. Horse owners may experience an enormous weight lifted off their shoulders when they are not concerned about feeding times. Always consider nutrition when dealing with any health or mental issue. Feeding a balanced diet (low in non-structural carbohydrates for overweight individuals) including free-choice forage is healthiest for your herd. Equines were not designed to thrive on a high-calorie, nutrient-deficient diet comprised of meals. By providing free-choice forage, you will have a healthier, more content herd. Posted in Health, Reviews and Links and tagged giveaway contest, hay pillow, juliet getty, kerry ridgway, monique warren. ← Christmas in July for our readers!